Three Roygirls have made the first ever Big V women’s squad selected by the VAFA to play AFL Goldfields in North Ballarat on 9 July. Fitzroy-ACU captain Gemma Minuz, Tash Ross-Harris and Claudia Bell started training with the squad and coach John Kanis on Wednesday night. Congratulations to our pioneering women and good luck with team selection as the squad of 60 is narrowed down to 24! 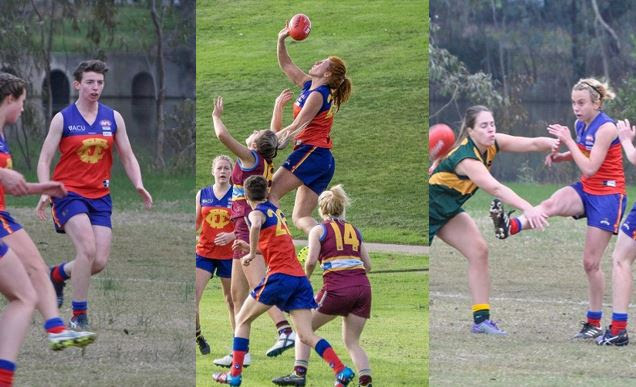 Gemma, Tash and Claudia will all be in action on Saturday at Ramsden Street, when the Fitzroy-ACU teams play a double header. The Women 2 team is playing Hawthorn at 11.40am, followed by Fitzroy-ACU Women 2 taking on Old Xavs at 2pm. A win for Women 1 will keep the pressure on SKOB Saints, who is in first spot on the Women’s Premier ladder, only ahead of Fitzroy on percentage. Lots of people reckon Lachie Henderson looks like an old-style player. Swap the red, yellow and blue with maroon and blue and you could be forgiven for thinking he’s a latter-day Noel Jarvis. Noel Jarvis, a dashing and creative wingman who gave Fitzroy great service in 159 VFL games between 1944 and 1952, featured on the Kornies football card. Best mate Matthew Gaite reckons Hendo’s a pretty complete footballer either on the wing or at half forward. “He has an extraordinary read of the game which has always impressed me the most,” says Gaiter. “Gets to the right spots, always backs up giving his team the best opportunity. Hendo and Gaiter met at uni about six years ago. 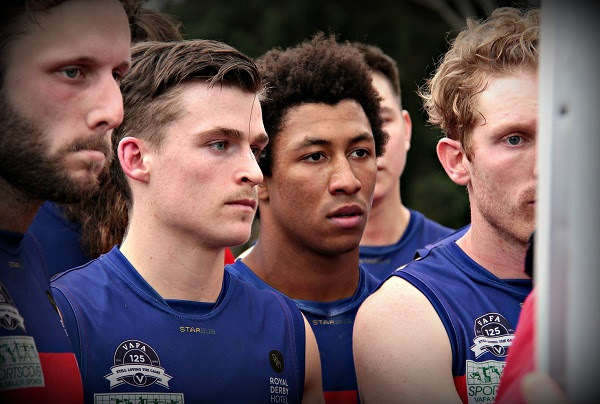 Together with Joe Atkinson, they agreed to move to Fitzroy to play together in 2014. Before that Hendo played juniors and seniors at Lower Plenty. So what do others reckon? Kerry Winchester thinks the firsts are always better when Hendo’s on the team. And Nathan Jameau reckons he’s got some of the slickest hands he’s seen on a football field. As for RedRoy, we reckon that Hendo’s played 50 fabulous games and we wish him a long and successful career at Fitzroy. Reds Ball – save the date! The much-anticipated Reds Ball is coming up on Saturday 15 July. Please save the date and more details, along with ticket sales, will be announced very shortly. The Fitzroy Seniors and Reserves are back at Brunswick Street Oval on Saturday, but one of the tallest men paying a visit, may not be on the ground. Victorian Premier, Dan Andrews, will be speaking at the sold-out pre-game lunch hosted by the Reds Foundation. Potentially you can expect as much action and excitement in the community rooms as on the field, if the last two Reds’ political lunches are anything to go by! 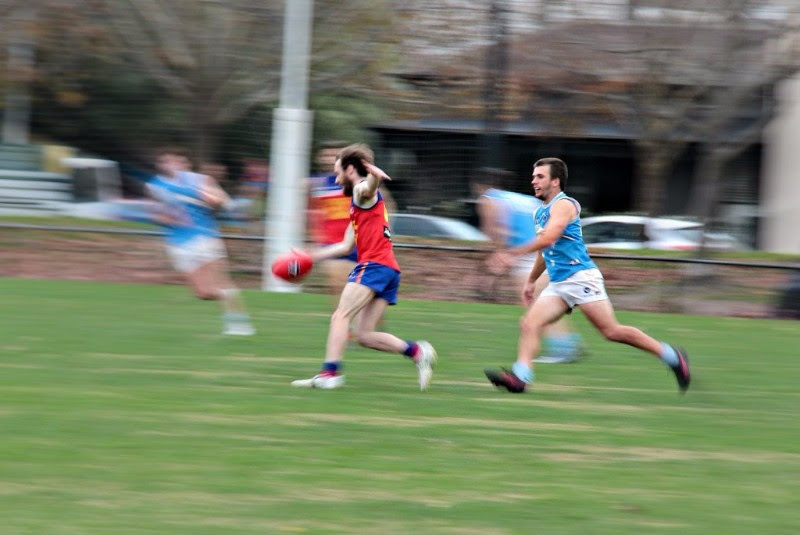 On field, Fitzroy will face a stiff challenge to generate back-to-back wins against second-placed Old Scotch. Sitting just outside the four, Fitzroy needs a win to stay in the hunt for the top four and launch an assault on the second half of the season. It would be great to see the youngsters, Nino Lazzaro, Sean Laidlaw (who made his first appearance for the Seniors in the win over Old Carey) and co, back up last week’s strong finish with a good show against more fancied opposition. The Reserves have strung together a couple of impressive wins, but they also will need to be at their best to knock off the undefeated Old Scotch B Reserve team. Meanwhile, the Fitzroy Thirds, currently our most successful men’s team (sitting in fourth spot on the Premier B Thirds ladder), is playing away against De La Salle and will need to keep winning. The team is in the four on percentage, ahead of Old Trinity. Get on down to Brunswick Street tomorrow and enjoy the atmosphere. 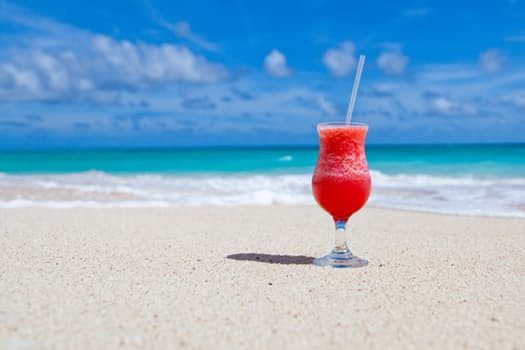 Make sure you save space for the BBQ lunch. 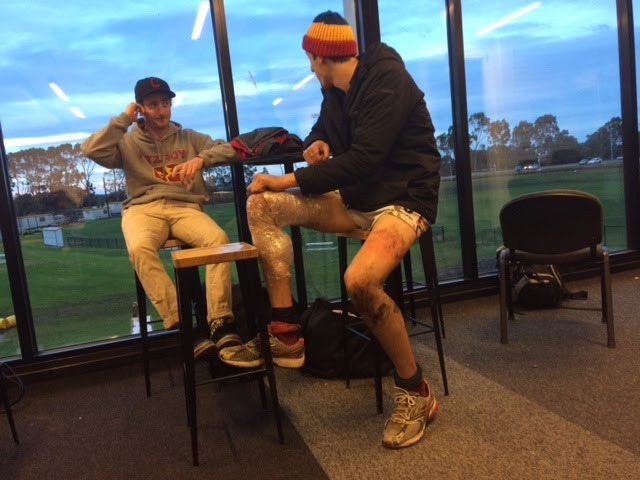 After some weeks of pain, the Fitzroy Under 19 (2) team will re-set this weekend, as the VAFA has regraded and approved a move to Holmesglen Under 19 Section 5. The second half of the season will start against Old Camberwell Grammarians this Saturday at 2pm at the Gordon Barnard Reserve 2. Get behind the newest Roy Boys and their coach Greg Coleman.